The QL40-ABI-2G is the latest generation of acoustic televiewers based on 20 years of experience and market leadership. The new system consists of a completely redesigned acoustic sensor and new electronics. The acoustic borehole imager records a 360°unwrapped and 3D image of the borehole wall. The tool emits an ultrasonic beam towards the formation and records the amplitude and the travel time of the reflected signal. The amplitude record is representative of the impedance contrast between the rocks and fluid. The travel time is used to determine accurate borehole diameter data, which makes the tool ideal for borehole deformation description – stress field analysis and casing inspection. A built in high precision orientation package incorporating a 3 axis fluxgate magnetometer and 3 accelerometers allows orientation of the images to a global reference and determination of the borehole’s azimuth and inclination. Sophisticated algorithms and real time processes are also implemented to extend the tool applications for casing thickness measurement, corrosion evaluation and measurement behind a PVC casing. The QL40-ABI-2G tool is stackable within the Quick Link (QL) product line or it can be run as a standalone tool. The ABI40-GR is a standalone tool integrating a built in natural gamma sensor. Read the Release Note for this new tool! Weight 6.7 Kg 14.7 lbs. Rotation Speed: Up to 35 Revolutions/sec. Processing techniques: Trace interpolation, despiking filters, normalization, recentralize image, etc. 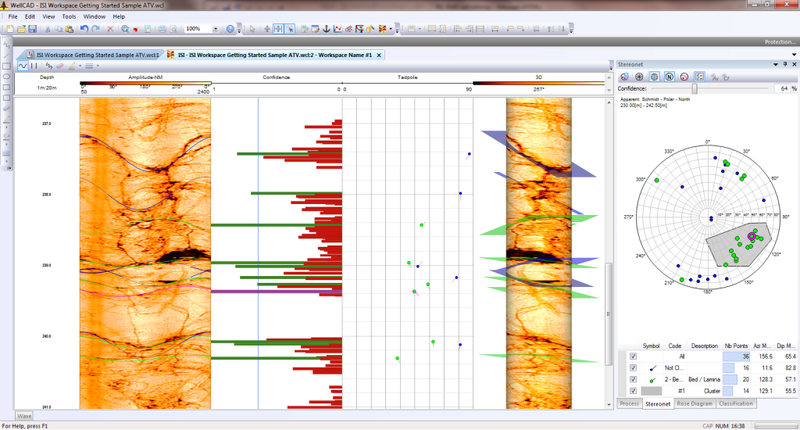 For more information, please refer to the WellCAD Image & Structure Interpretation Workspace news post.